PDF password unlocker removes owner level restrictions like: copy, edit and print from secured PDF. As the tool delete security from PDF file users can save the resultant document ant any desired location. PDF security remover is compatible with all Windows OS versions from 10, 8.1, 8, 7, etc. to remove PDF protection. All the basic restrictions of PDF files like editing, printing, copying, and extracting text, signing, commenting & creation of template pages can be easily eliminated by PDF Password Remover tool. Process of removing protection from PDF files becomes quite easy by using this PDF security remover solution. Once the tool delete security from PDF users can save the file at any desirable location. 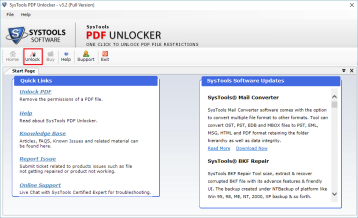 Use this PDF Unlocker tool and remove protection from PDF document having password security. The software allows the user to remove the known document open password from PDF document. However, once the PDF file gets unsecured the resultant file will not prompt for the password. Also, the tool will not ask for the permission password while removing PDF file restrictions. With the single file mode, users can remove security from the single PDF document. All the restrictions of copy, print, edit, sign, comment, etc., can be removed by the software. But, if in case they want to unlock multiple PDF files then it is necessary to order the business or enterprise license of the software. PDF Unlocker Software immediately lists all the associated permissions as you browse and load any PDF file. You can see the current status of PDF file permission in ‘Before’ & ‘After’ column. PDF file restrictions are listed in that table. However, once the software will remove PDF protection the permission status gets changed accordingly. PDF Security Remover software can remove password from PDF file by maintaining the file's structure and data hierarchy. The tool will not make any changes to the original formatting when it remove restrictions from PDF files. Also, It will keep the attachments and other formatting intact for the respective document. Once the process of removing PDF password protection gets completed, users can save the data at any desired location as per their need. At the other end, amenity to add up PDF files into a newly created folder is also packed with PDF Security Remover Software. Moreover, it allows you to create a new folder straight away from the software panel for saving the document. How can I remove PDF security with this adobe PDF password unlocker tool? Is it possible to remove PDF restrictions with this PDF Unlocker software? Yes, PDF Password Cracker easily remove encryption from PDF files and allows the user to save the file at any location. What types of restrictions does the PDF Security Remover Software eliminates? The software removes owner level security from PDF files. Moreover, restrictions like print, copy and edit and extract can be easily removed by the tool. Is it free to use PDF Password Cracker software to delete PDF password? In the demo version, PDF Password Remover will unlock password protected PDF document but there will be the watermark in documents. I already knew the security code to open the locked PDF file. Why should I use this application? It's good that you the password of the locked PDF document. But, if want to remove PDF protection permanently then you can use this PDF Password Remover utility. 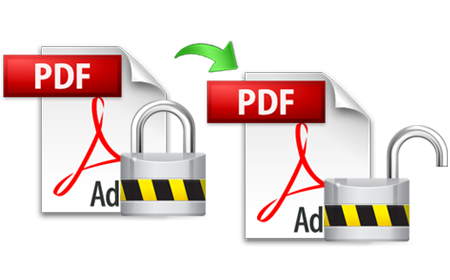 It is a perfect solution to remove security from Adobe PDF files. Does the software allows users to remove unknown password from multiple PDF files? No, this PDF Unlocker tool cannot remove PDF password if it is not known to the user. But, if the user knows it then firstly, they need to provide the appropriate password and after that tool will remove it. Also, the resultant PDF documents can be saved without any password security. Additionally, along with the passwords tool also removes the restrictions from PDF files. 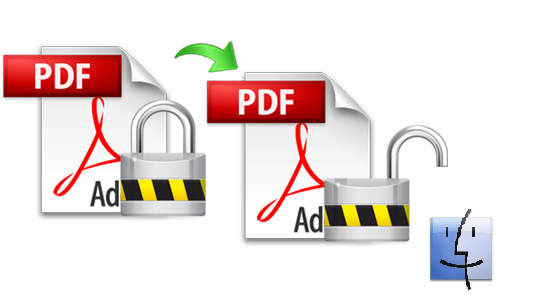 Adobe PDF Unlocker tool helped me to remove restrictions from PDF files. Moreover, the graphical user interface of the software is self descriptive such that users can understand it easily. I am completely satisfied with this software." To remove PDF password without losing even a single bit of data a technically integrated application was required. So it was PDF Security remover that assisted us to remove restrictions from PDF without investing huge amount of money. Hats off to the developers! Thanks to the developer of PDF unlocker software, this tool really helps me out to remove password from multiple PDF documents. Initially, I was afraid of using this PDF Security Remover tool but, the software works really well and helped me to remove protection from PDF files. Barely, I can’t remember several PDF file passwords and I worried about it. Finally, I got the PDF Password cracker software which unlock PDF files within a few seconds. I must say it is very helpful application. 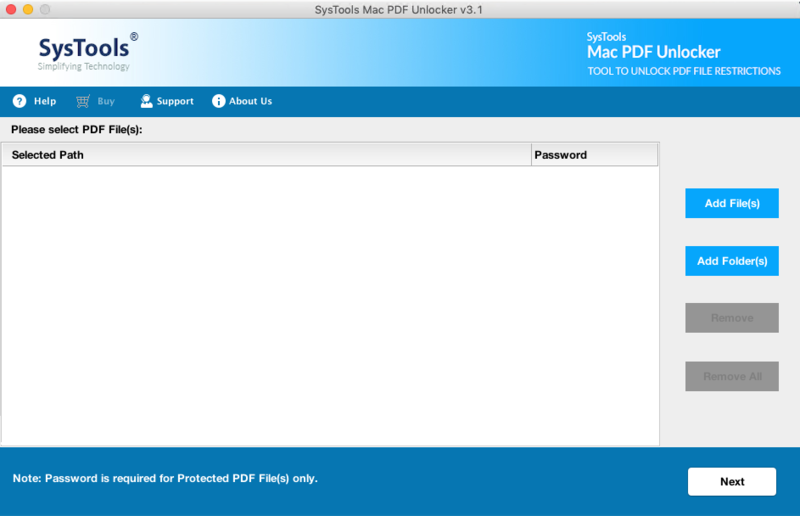 Unlock secured PDF on Mac OS X for copy, print, extract, edit, etc. With this Mac PDF password remover, a user can easily delete security from PDF documents. Restrictions like copying, printing, editing, signing, commenting, etc can be easily removed by the tool in just a few clicks. Moreover, this PDF Unlocker for Mac easily remove protection from PDF documents and enables the user to fill data in several PDF forms. The PDF security remover for mac provides Add Files or Folders option to delete security from PDF documents in batch. The application provides the facility to remove encryption from PDF files having common or special restrictions. All the security restrictions are eliminated by Mac PDF Unlocker software without any hassle. If the file is secured with user-level password protection, then the PDF encryption remover for Mac OS X can remove known password security from PDF documents. But, initially user have to insert the password & once the password is applied, the tool will unlock PDF document. This resultant PDF file is free from any password protection and it will not prompt for the password while opening it. This Mac PDF Unlocker Software is compatible with macOS Mojave(10.14), macOS (10.13) High Sierra and all the below versions such as macOS Sierra (10.12), OS X El Capitan (10.11), Mac OS X 10.10 (Yosemite), Mac OS X 10.9 (Mavericks), Mac OS X 10.8 (Mountain Lion) etc. This application is designed with such a user-friendly interface such that any novice user can use it easily. When the Mac PDF Unlocker software completes the process to delete security from PDF documents, it creates the report. This report contains the Export report and all unlocked PDF files. The Export Report is in .csv file format containing all details like selected path, destination path, unlock status, total count, fail count and success count of PDF files. One can easily refer this CSV report in future also. While removing restrictions from PDF files this Mac PDF Unlocker software maintains file formatting as well. Users don’t have to worry about the data loss or any other issue, everything is preserved. Moreover, attachments present in the PDF document is also preserved by the software. How Mac PDF Unlocker software remove restrictions from PDF files in the batch? Can I use this Mac PDF Unlocker tool for Mac on OS X Sierra to delete security from PDF files? Yes, of course, you can easily remove protection from PDF files on Mac OS X Sierra. Moreover, this utility supports Mac OS X 10.8 and all above versions. How tool unlock password protected PDF on Mac OS X? In order to remove password from PDF files firstly, the user has to enter the password. Once the password has been applied the PDF Unlocker software creates an unlocked PDF file. This resultant document is free from any password protection and restrictions. 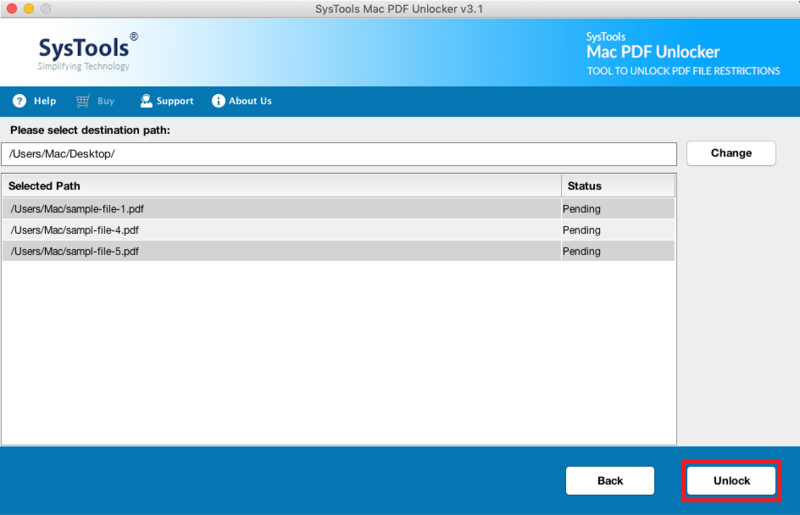 Do I need to install any extra application to remove encryption from PDF file with the help of this Mac PDF Unlocker software? No, there is no need to install any extra application to delete security from PDF files, this tool is independent enough to unlock PDF files without the installation of any extra software. 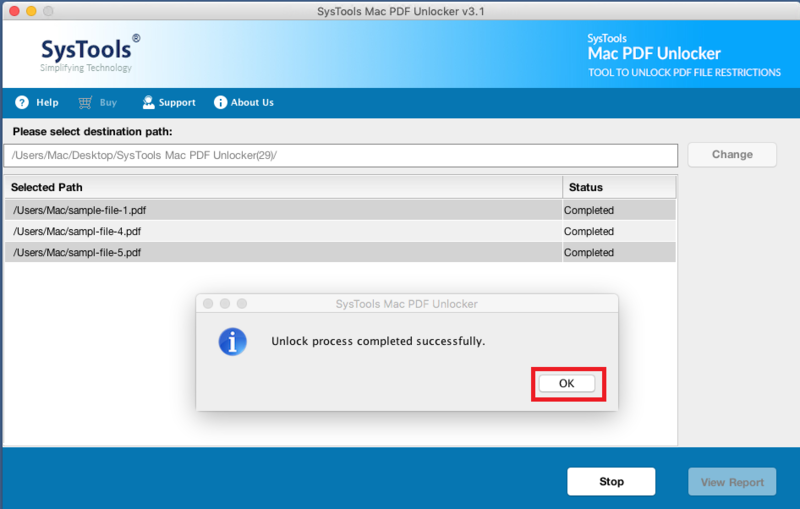 Does PDF Unlocker for Mac tool remove extract restrictions from PDF files? Yes, with Mac PDF Restriction remover software you can easily remove extract restrictions from PDF files. Along with the extract restrictions the software also removes other types of restrictions as well. How to remove or delete password security from bank statement PDF files? To remove protection from Adobe PDF bank statement, firstly user has to enter the respective password of the bank statement PDF document. Once the password is entered the Mac PDF Unlocker software creates an unprotected PDF. This document will not contain any password or restrictions. What Our Clients Want to Say? "My boss sends me a secured PDF file for some official purposes but he added copy restrictions in it. I have given a task to make some reports by referring this document and have to complete the task in the given time. But, I was unable to copy data from PDF document. Then, my friend suggested to use Mac PDF Security Remover tool and with this application I can easily copy data from secured PDF document." There are many software to to unlock PDF files on Mac OS X but, none of them found to be more reliable than this Mac PDF Unlocker Tool. This software remove protection from PDF documents in the best ways. It is the fast and effective solution to remove PDF restrictions. "A few days back one of my friend send me a PDF file, I need to make some changes in the document. But, when I tried to make some changes in it I had found that the file is secured with restrictions. So, I was looking for a reliable solution which can remove restrictions from PDF document quickly. But, thanks to my friend who suggested me this Mac PDF Unlocker Software. This software easily delete security from PDF file without any data loss. Thanks to the development team for the amazing application!" "I was in the dilemma while picking the best software to remove PDF restrictions. 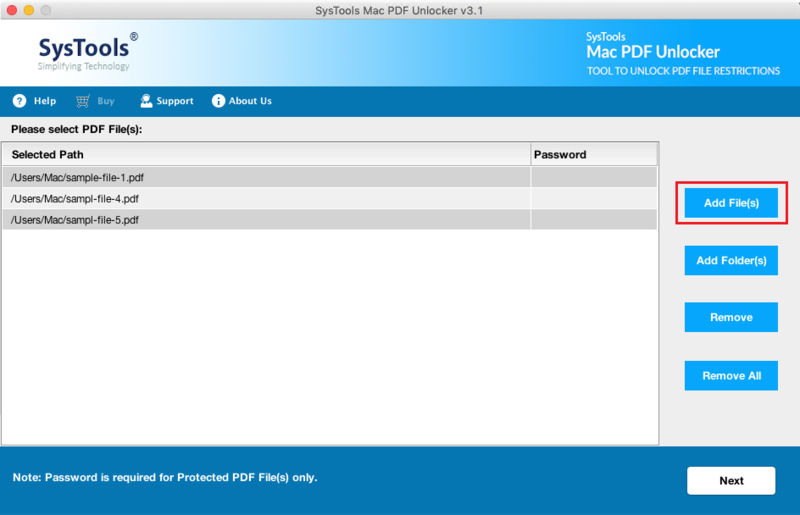 As there are many Mac PDF Unlocker tool available in the internet. Finally, I have found Mac PDF security remover tool, it easily resolved all of my problems. I would like to suggest this software to everyone who wants to unlock PDF on Mac OS X.!!!"